You can not go to Memphis and not visit the National Civil Rights museum. Outside the museum, there is a woman who has been protesting for over 18 years, saying the museum reminds people of a wrongful past and it should be closed down! It sounded to me like a strange demand, after all thats what museums are for, to learn from the past. I didn't get a chance to speak to the protestor, as she was sleep inside her makeshift tent, and I did not want to wake her up. The museum is built right next to the motel where Dr. Martin Luther King was assassinated. The room is kept almost as it was when the assassination took place. As you walk through it, you can't help but get the feel of the injustice and the wrongs of the past. The ugly KKK rallies, the horrible pictures of lynchings, films of life under segregation. I sat in one of the buses from the days of segregation. Rosa Parks started her protest by sitting in the Whites Only section of one of these very buses. Then once you get a good feel of the injustices, the museum takes you through the non-violent struggle of the civil rights campaigners. A film showed how the activists were trained in resisting to lash back at violence, and then an actual film shows how activists are sitting in a whites only bar, getting punched, spat on and cigarette ashes flicked on their head but magnificently resist to return violence with violence. There is the exception of one young black boy. Several white youth gang up on him, at first he takes their punches and kicks without returning their blows, but soon he gives up and fights back :) giving as good as he gets (almost). I couldn't help murmuring with delight "Go on my son!" and wished I was there next to him helping him fight back the thugs. 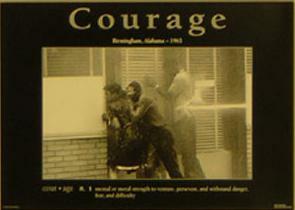 The film shows the young black boy being arrested after the scuffle, his mother is interviewed. As she wipes a tear off her face she asks in her sweet southern accent, "what did my boy do wrong?" and there I got a lump in my throat. The museum is really a must see and I definitely recommend it. Shame one is not allowed to take pictures inside it. Gandhi reminds us the means are the ends in the processes of becoming. You do not achieve goodness by evil means. "Nonviolence means avoiding not only external physical violence but also internal violence of spirit. You not only refuse to shoot a man, but you refuse to hate him." -- Martin Luther King Jr.
Increasingly aware of the unity of all being and our mutual interdependency with every other person on the planet and with the earth itself, a new paradighm must evolve in the 21st century in ways that make it sustainable and a voice for global sanity. That evolution will require a willingness to leave behind or transcend chauvinist, ultra-nationalist, and tribalist elements of our past, but to be authentic it must incorporate much of what has been spiritually vibrant and powerful. I recall the Four-fold noble truths of Buddhism -- the world is full of suffering. "Birth is suffering, death is suffering, old age is suffering. To meet a man one hates is suffering. To be separated from someone one loves is suffering. You get the point. Hardship is a universal truth." If life indeed is a series of hardships, how can we deal with this situation? Are there philosophies of life offering? Is suffering universal or it only relates to certain people of our global village? Do some segment of the society suffers more than the rest? How could this be so true? How can we the humans work together in eradication of all sufferings? How can we all share this urgency of brotherhood and expand it to all? I believe every life is significant. I believe every situation is a golden opportunity which one humble person can make in the world--just by doing right and touching the lives of others. The reward is just magnificent. Life can be wonderful and can be not so wonderful sometimes. Yet it seems that at the root of all these philosophies, religions, and other schemes lie eternal truths that actually may work. The truth that we, all the inhabitance of this earth, need each other now more than ever before. We need one another, no matter what soil we are living on. No matter what nation has harbored us. We simply need each other. The experience in life has shown that things were bound to get better at some point in the future. The opposite is true as well. Life flows and changes and nothing stays the same. So why do we expect too much or do we expect so little? If these people can face the tremendous blows dealt to them and turn their lives around to create happy, satisfied, and successful lives, the least I can do is attempt to do work on my little problems. I have also learned that everything happens for a reason and that you only have to pay attention to what comes to you. You will find what you need and what you need will find you. Being open and accepting of this Synchronicity in our lives leads to serendipity--the finding of valuable or agreeable things not sought for. Prehaps the words I am looking for are optimism and love. In perusing our happiness, I think we should peruse a spiritual rather than religious understanding of divinity. In 30 years or so, Iran will be another Afghanistan or N.Korea ruled by ignorant fools. My heart is with a secular, democratic Iran.